Our quilt sets can also be used as bedspreads, coverlets, comforters and room decoration art craft. 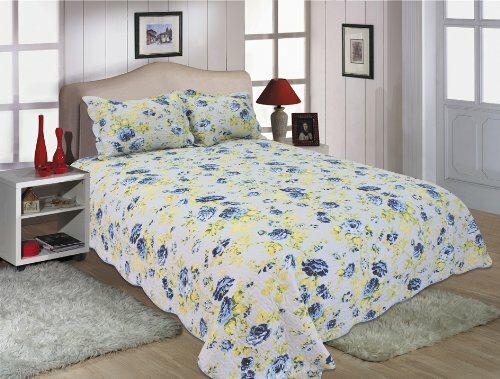 The beuatiful floral design will make your bedroom sweet and lovely.The reversible back side is printed with white flowers on blue background, which increase its practical use and provide nyou with more choices for the decoration of your bedroom. All quilt sets include pillow shams. Twin Size (68″ X 86″) + 1 standard pillow sham(20″ X 26″ +2″ flange); Full/queen size 86″ X 86″, 2 standard pillow shams (20″ X 26″ +2″ flange), king size 90″ X 100″, 2 standard pillow shams (20″ X 26″ +2″ flange). This is a wonderful choice for your bedrooms, daybeds and also as a perfect gift for your friends such as weddings, baby showers etc.